Bank routing number? If you’re a millennial, you probably have that file somewhere in the “things I’ll never need to use” category. But, knowing how to find your bank’s routing number is more important than you realize, and surprise… it’s not that hard! To help you with this pretty basic piece of personal finance advice, I’m going to show you how to find your bank’s routing number using Chase Bank. I personally do some of my banking with Chase, and finding the Chase routing number is going to be really similar to how you would find the routing number for any other bank. If you’re thinking about disregarding this article as non-essential knowledge, don’t! Knowing how to find your bank’s routing number is something you will need to know, even if you aren’t writing checks. I’m going to take this step-by-step to make it as easy as possible because… well… we’re millennials… we need to get back to brunch, killing the diamond market, and any number of things older generations accuse us of spending too much time doing. But also because we’re millennials, we deserve more than dumbed down personal finance advice, so I’m going to throw in even more information about Chase routing numbers so that you can show off your bank knowledge the next time someone accuses you of being a stereotypical lazy millennial who doesn’t know this kind of stuff. How do routing numbers work? Grab your checkbook (I know you have one somewhere), and open it up to literally any check. Your bank’s routing number is nine digits long and is going to be the first set of numbers starting in the bottom left-hand corner of each check. This is the same for Chase routing numbers and routing numbers for any other financial institution. Your routing number is the 9-digit set of numbers after that weird little symbol, in the center is your bank account number, and to the right is your four-digit check number. See your Chase routing number! Looking online is normally how I find my Chase routing number… it’s actually how I find any of my bank’s routing numbers because sometimes it’s easier than getting up to grab my checkbook. 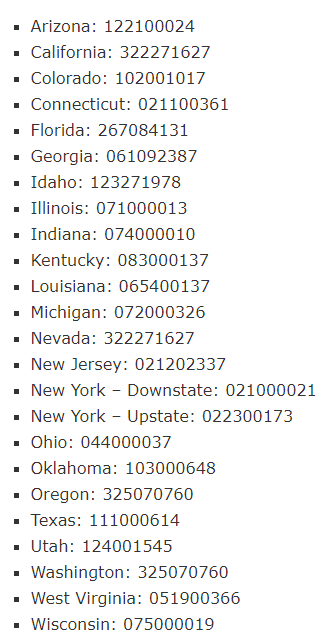 If you bank with Chase and know the state where you opened your account, then you can use this table below to find your state-specific routing number. There are 24 different Chase routing numbers, and most larger banks will also have a long list of routing numbers organized by state. Even though many large banks have a bunch of routing numbers, each bank is only technically allowed five. The reason larger banks, like Chase, have so many is that they’ve acquired or merged with other banks over the years. If you bank with a smaller bank, it’s possible that there is just one routing number for all of the accounts held through that bank. No matter where you bank, your routing number will stay the same as long as you have that account open and whether or not you move to a different state. You will need to know how to find your bank’s routing number if you want to process payments over the phone, set up automatic bill pay, and do wire transfers. But, you might need a different routing number for some transfers, which I’m going to cover a little farther down. You may only need to know your routing number a couple of times per year, but when you need it, you need it. M$M tip: Want more basic personal finance information? Here is a list of 37 Personal Finance Terms Every Millennial Needs to Know. Even if you already know how to find your bank’s routing number, you might not actually know what it means. I’ll be honest, I didn’t for a long time, but it is kind of interesting how this stuff all works. Whether we’re talking Chase routing numbers or routing numbers from any other bank, your nine-digit routing number is also known as an ABA (American Bankers Association) number or RTN (Routing Transit Number). Those numbers tell banks where to process your checks. This system of processing checks goes back to 1910, way before electronic processing, and those routings numbers helped bankers sort, bundle, and deliver checks back to the check writer’s account. First four digits. This is the Federal Reserve Routing Symbol, belonging to one of the 12 different Federal Reserve banks across the country. Second four digits. These numbers reference your specific bank and are assigned by the ABA. They are called the ABA Institution Identifier. Last digit. This is a check digit used to verify the routing number’s authenticity. The SWIFT Code is what international banks use to transfer money to and from accounts globally, and SWIFT stands for Society for Worldwide Interbank Financial Telecommunication. Phone: For existing accounts, call 1-800-935-9935 to speak with someone at Chase 24 hours a day and seven days a week. In person: With over 5,100 branches and over 16,000 ATMs nationwide, you can find the closest Chase branch here. I know my readers are smart, but even the smartest of us may have benefited from an overview of how to find your bank’s routing number. Again, it’s very basic personal finance, but when you aren’t using checks that often, you kind of forget that stuff even exists. Remember, I used Chase routing numbers as an example because I bank with them and have access to checks and their online and mobile platforms, but I’d say that finding your bank’s routing number is just as easy for most banks. You can even search “how to find ______ routing number,” and BAM, the internet will help you. When was the last time you needed your bank’s routing number?